April 10, 2019 – Drupal 5.7 is just three weeks away, and with it will come the Drupal layout builder. Drupal has always been about accessibility, and the last several years have only seen that commitment ramp up as the teams behind the open source platform have begun to invest more in matching the true ideals of open source. The layout builder marks a new stage in the CMS’s life; one in which content creators and managers no longer have to rely on developers for the minutiae of complex Drupal builds. Instead, content updates can be deployed quickly and effectively through a WYSIWYG editing interface. 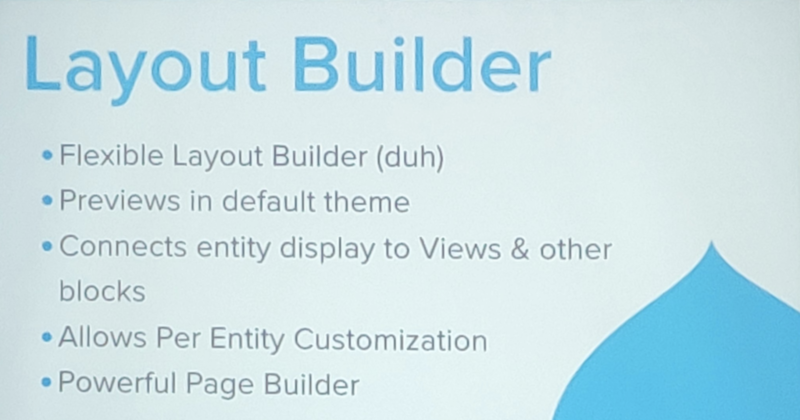 The new layout builder is essentially a WYSIWYG, with default theme previews, per entity customization, and connection between entity display, and views and other blocks. A powerful design tool, Drupal’s layout tool goes beyond standard layout builders by allowing sitewide edits to templated content. This incredibly powerful feature means that site builders and content managers can add content to pages throughout a site with minimal effort and time commitments. Another strong feature is the ability for content creators to easily create and push custom pages with unique designs and layouts. By adding blocks to a blank page, creators can easily push videos, maps, text, or custom-built widgets. As adoption increases for the layout builder, we expect more modules to appear that will add increasingly diverse functionality to the builder. The Layout Builder: When Can I Get It? If you’re looking to stay ahead of the crowd, you can actually download and install the beta module for the layout builder now. This will give you access and time to explore the new feature’s functionality before going live with it. The full release will be with Drupal 8.7 in three weeks. Keep an eye on the layout initiative page for more up-to-date information. If you’re looking to start adopting Drupal and the new layout builder with Hostdedi, you can currently install the module on your Drupal instance and begin working with it. Alternatively, when Drupal 8.7 is released, you can either update your instance yourself, or you can get in touch with our support team and they will update your Drupal site for you. As always, we recommend testing any new updates on a development site before going live. We especially suggest doing so with the layout builder, to see how and if it will affect your existing site.